There are lots of reasons to redesign your small business website, but if you suffer from any of these 3 weaknesses, it's time to invest in some changes. Is your website delivering the same user experience everywhere? 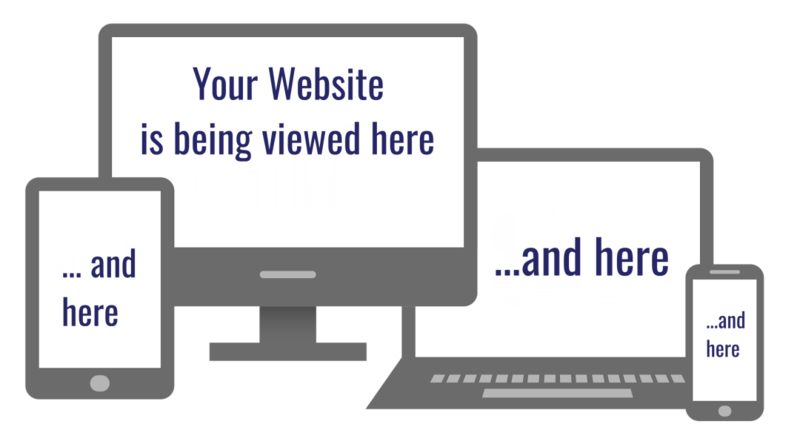 Potential customers are viewing your website on all kinds of web-enabled devices. If your website can't be easily viewed on all sizes of browser-enabled devices you're actually driving traffic away from your site and towards your competition. That's right, in later 2016 the balanced tipped in favour of mobile. Now over 50% of all potential web traffic to your website is coming from mobile devices - and that number just keeps growing. Mobile users are on the go, viewing your site on small screens and they need a site that works with that reality. As a result, when they don't find that, they leave and go off to another site that's easier to use. Not having a mobile responsive website leaves you behind and sends potential business elsewhere. If your business looks outdated, and comes across as out of touch, you won't be attracting visitors as well as others in your market. If your competition has a better website, they must have a better business too, right? That's is one of the many assumption visitors will make about your business within a few seconds of visiting your website and measuring it against your competitors. Can your website be easily used on ALL touch-enabled devices? There seems to be a little confusion about what "touch-friendly" means. Most seem to think that's the same thing as being mobile-friendly. Mobile devices are touch devices, so the touch experience is key there, absolutely. Touch-friendly is a part of mobile-friendly, but there is more to consider than just that. You can't really design touch-friendly without considering all the touch enabled devices your website viewers are using. Lots of laptop and desktop computers are touch enabled these days. I work on one everyday, so I've become very sensitive about this particular common weakness. And we're seeing a rise of web-enabled touch devices everywhere, from appliances to automobiles. Understanding touch behavior and designing for touch is the future of digital design. Providing an easy touch experience and not relying on hover actions for things to appear or work properly is an absolute must if you don't want to send users away from your site in droves. I see this mistake being made even by web design companies and professionals. I've been doing my own competitive research lately and encountered several websites by design professionals that couldn't be touch scrolled. Yikes. Others suffered from poor touch function with navigation menus or had navigation elements that were hidden completely. Ouch. Designers can be creating a poor touch experience in their designs without even realizing it if they are unaware of how touch screen laptops are used, and how they differ from mobile devices. If you use a touch screen laptop you are probably well aware of what I mean and have experienced how frustrating it is to work with website designs and content elements that have ignored your user experience completely. Good design practices like touch-friendly design thinking can improve the overall user experience for every visitor. Correcting common touch-friendly problem areas like complicated navigation menus and hidden hover elements replaces unnecessary complication with simplicity. Examining your website design to evaluate its touch-friendliness forces you to consider the user experience of others, not just yourself...an approach that always improves design overall. The bonus of a touch-friendly design is that is doesn't take anything away from the non-touch enabled device user experience. It's a win-win way to approach usability for all devices. Is your content sending the right messages and getting the right response? You can't design anything without content. It's what people view, take in and remember. Content tells your story and drives actions. Over 20 years ago Bill Gates wrote an essay entitled "Content is King" outlining the importance of content in the digital era. Yet, all these years later, weak content is one of the most common problems I see when evaluating small business websites. And content is the biggest area of struggle for more website owners, during the design phase and afterwards throughout the life of the business and the website. The words, pictures, graphics, videos, audio files - all the stuff that makes up a website is the content. What's wrong with most small business website content? Practically no text content at all. Content that doesn't deliver the right message. Text content that is difficult to read. Content that repels visitors instead of drawing the in. These are just a few of the most common content woes, but the list can go on and on. There are so many ways to go wrong with content. You need to give it all a hard look to root out the problem. Can people clearly and simply understand what you do and how to work with you? Are you missing content that helps users solve their problems? Is your content on the page in a way that is easy to scan? Does your content give you credibility and have a sense of authenticity and authority? Does the visitor know what actions you want them to take? Is your showing up on Google for your industry keywords? Having a website for your small business is vital. But the website's mere existence isn't going to do much in this crowded and competitive internet. If you have expectations for your website's performance it's important to define them clearly, then make sure you have created the content that can deliver the results you after. It's important to remember that Google indexes web pages, not websites. That means every page of your site needs to be evaluated and improved to stand a chance of being found for your desired keywords and phrases. Every page is an opportunity. You have to examine closely where you may have missed the opportunities with your content. Or, find places where you can create new ones. Then you have to make sure that content engages the human audience. It has to be solving their problems, building their trust and getting them to take the action you desire. None of that is easy. But it's necessary for any chance of success. How will you use content to engage your audience? It's not just about the basic pages of your website anymore. Those need attention, but once's that's done the content work isn't best to be over. Content quantity and content frequency can affect your web presence and ranking as well. We live in a content world and having content for social media and content marketing is also increasingly important. You can start to see how after you get through the initial "design" part of your website that there is an ongoing need for content creation, content management and content publishing. Like I said, content is everything. Getting to the bottom of content problems and figuring out how to solve them is a big task. But it's an important task to acknowledge so you can begin your budgeting and planning in order to create a website that better connects with your users. Is your small business website suffering from any of these 3 problems? The good news is, it's never too late to fix these weaknesses and create a great user experience that will bring visitors to your website and keep them there. My WordPress design packages are created with the needs of small business owners in mind. When you redesign your small business website with the the focus on what really matters you can create a better user experience, grown your website traffic and convert more visitors into leads...and more leads into more sales.